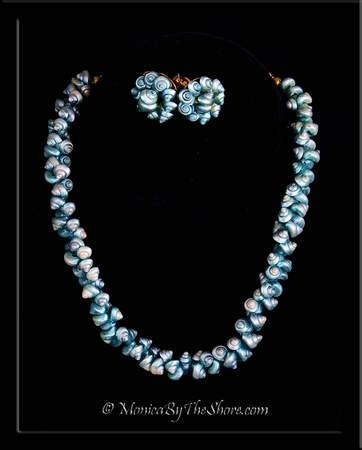 Own a piece of history with this beautiful antique teal colored Trochus Shell lei necklace and earrings set. The matching pair of screw back earrings are copper findings as is the chain and clasp on the necklace! The lei necklace is 16 inches in length and can be worn up to 3 inches shorter by clasping the copper chain tighter. 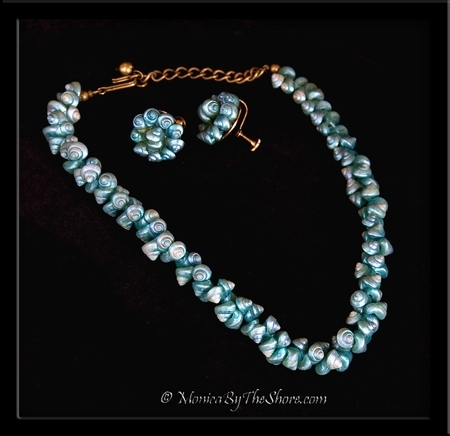 This vintage seashell jewelry set is of the early 1940s WWII era. A beautiful set of Polynesian seashell jewelry with so much history, and quite the unique conversation piece! A great addition to any antique shells jewelry collection. Rare antique seashells jewelry designs presented by MonicaByTheShore, of Haleiwa, North Shore Oahu, Hawaii.